In a previous post, I explored how to improve the user experience for external users in SharePoint Online/Office365 by enabling profiles and picture editing for external users. This post will explore how to create audiences for your external users, so that you can further target information to them and personalize their experience. 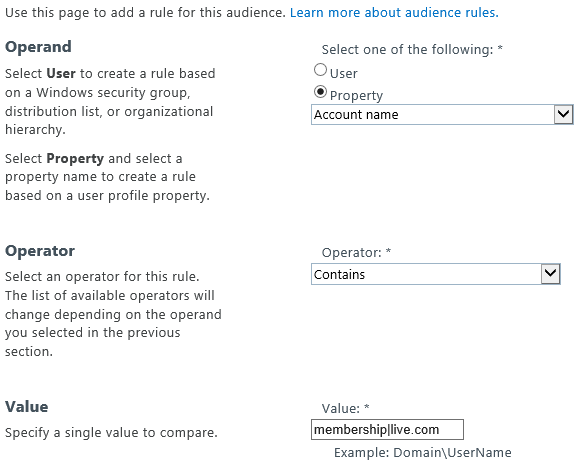 To create an audience for external users, it’s as simple as creating an Audience Rule, where Account Name -> Contains -> “membership|live.com”. 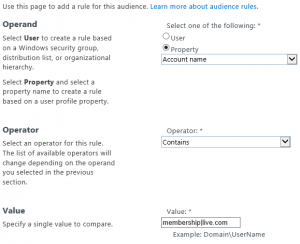 Audience rule based on Account Name. 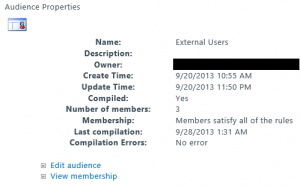 Audiences compile ONCE A WEEK in SharePoint Online! Since audiences only compile once a week (sometime late Saturday night/early Sunday morning from what I can tell), audience targeting may lag for newly added external users. Microsoft could increase this to a daily schedule, but has shown no plans to do this yet. If you are interested in using audiences, be sure to let Microsoft know (support ticket). The more people that ask for it, the more likely they’ll look into getting it done. Similarly, you can create an “internal user” audience with the same rule, only swapping the Operator to “Not Contains”. Once your internal/external user audiences are compiled, you can then start to use audience targeted web parts throughout your site collections, and enable some advanced scenarios. 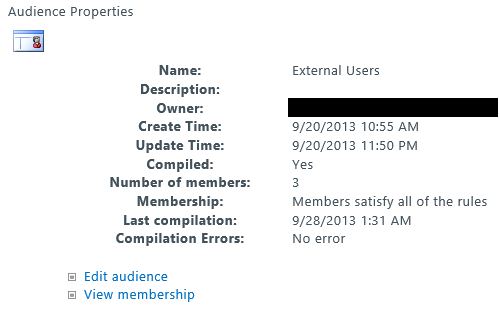 I’ll show just such an example in my next post, around adding social capabilities for external users.